Engraving from 'London', by Charles Knight, showing the India Museum in East India House, Leadenhall Street, in 1843. To the left is Tipu Sultan's men-eating tiger automaton. The tiger was taken from Tipu Sultan of Mysore, after the storming of Seringapatam (Srirangapatnam) in 1799 (at which Arthur Wellesley, the later Duke of Wellington, played a prominent role). See also the saddle cloth, allegedly taken from Tipu Sultan, and now in the Victoria and Albert Museum. In ensuing years the India Museum received objects from the Great Exhibition of 1851. The Indian Mutiny of 1857 brought about important changes in British rule of India. 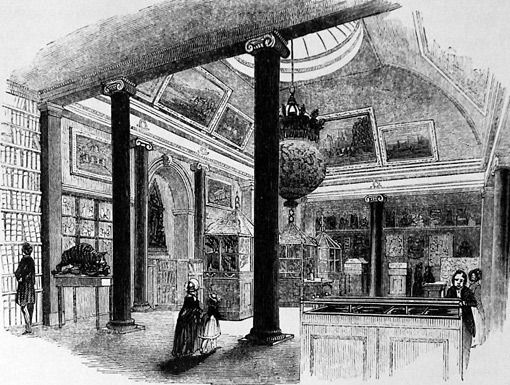 The East India Company was disbanded in 1858, and in 1863 East India House was demolised. By that time, from 1858, the collection of the India Museum had passed to the new India Office and into the hands of Sir John Forbes Watson. In 1875 the India Museum was housed at a site in South Kensington, but in 1879 it was dissolved and its collection dispersed. In 1880 the Indian Section of the South Kensington Museum (renamed the Victoria and Albert Museum in 1899) was officially opened (although it kept its popular name of India Museum until 1945). The collection of the early nineteenth century India Museum contained a wide array of Indian textiles, including Kashmir shawls, carpets, silks, cottons, and various garments. The piece of cloth with beetlewing embroidery discussed elsewhere was one of the pieces that were transferred to the South Kensington Museum (V&A acc. no. 6281(IS). Digital source (retrieved 27th March 2016). Digital source of illustration (retrieved 19th June 2016).